What are solar led markers? The solar led markers (also called solar road studs, solar pavement markers, solar cat eyes) are raised marks that fixed on ground, which have the same function with the marked lines painted on the road. The solar led marker is a kind of safe and green traffic solar product, which absorbs sunlight in the daytime, and the solar energy is transformed into electrical energy, which is stored inside the energy storage device. At night, the electrical energy will be transformed into light energy, which is controlled through the light-operated switch. Together with the marked lines, they can delineate the ways for the motorists driving on the roads. The solar led markers can take place of the marked lines to delineate the ways at night or on rainy days for its perfect reflectivity. 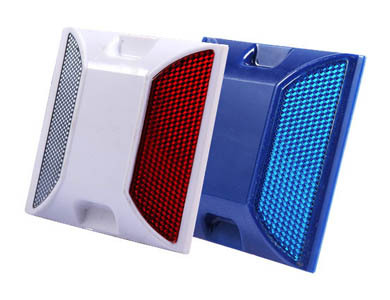 In recent years, the solar led markers have widely used in our daily life with the rapid development of the road construction and people’s concentration on traffic safety. The solar led markers can be used in various road conditions, and they are energy saving products when compared with other road studs. There is facility in it that can transform solar energy into electrical energy, which can give out light to guide the way for people passing by. It can be used for a long time if it is fully charged, and it can also work normally if it comes to rainy days when fully charged. The solar led markers have strong pressure resistance, and they can resist the static pressure of over 20 tons. It is easy to install, and if using the right mixed glue, the solar led marker can be fixed firmly on the ground. In rainy or cloudy days, the sights of the drivers is not that good, if the vehicles go across the solar LED markers in lane departure, the drivers will feel the toss and make their vehicles to the right way. 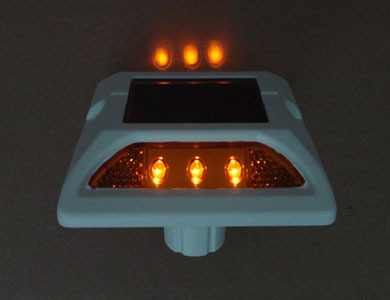 The solar led marker of NOKIN TRAFFIC FACILITY is favored by consumers home and abroad. NOKIN has engaged in the field of traffic safety facility for over fifteen years, we have our own research and development team, who has always worked on improving the performance of old products and innovation of new ones. The main products of NOKIN are the road studs in plastic, aluminum, solar types, and other solar traffic safety products. Our waterproof plastic road studs have been sold home and abroad for its high quality and perfect shape. NOKIN can provide the ODM service for you, and we would provide drawings and finished products as the samples that the clients give us.